One of the toughest things to learn about healing is how to set up your user interface. Blizzard more or less acknowledges that the default UI is not very good for raid healing, so you're probably going to bring in one or more addons to help you heal. But with that comes the burden of selecting and configuring the tools. It can be a challenging task, and I wanted to share some of my thoughts on how to go about that. Healing an intensive fight can put some real stress on the player. Healers have to react to events more than any other role, and (unless you're dedicated to healing a single tank) you'll be watching multiple toons to see what happens — sometimes a full 25. That's in addition to watching the mob's health, in-game events, adds, void zones and all the other things that everyone has to manage. Watching so many things at once means you're relying heavily on your user interface. It provides you information and enables you to act. A good UI can make that as easy and natural as possible, but a bad UI can slow you down and make it difficult to heal well. You will be adjusting your UI. The default Blizzard UI fails for healing raids. Out of the box, you'll only ever see the health of your own group. You can configure it to be a bit better, by dragging the raid health frames into the field, or maybe by turning on the health bars above characters' heads. So you're changing things from the start. Almost every healer ends up making further changes, either through macros or addons. But before we talk about that, how would we want our UI to work? There's a concept that the US military uses, called the OODA Loop. OODA stands for Observe, Orient, Decide, Act. I believe they use it for strategic thinking, but it applies even to the extremely tactical work of healing. First you have to observe: what are the mobs doing? Who's taking damage? What are the other healers doing? Orient in this case is about all the background information that informs your healing. What's your role — main tank heals or raid heals? Who's most important to save? What is the boss going to do next? Based on that, you decide what to do: who are you going to heal, and what are you going to cast? (Or maybe you need to move out of that void zone instead!) Finally you act by casting your spells, whether it's a click or a key press. And then? Observe what happens and do it again. This all happens in tiny loops, of course — as fast as every 1 to 1.5 seconds when healing is intense. But it's good to realize all these components of the process, because your UI can fail you at any one of them. 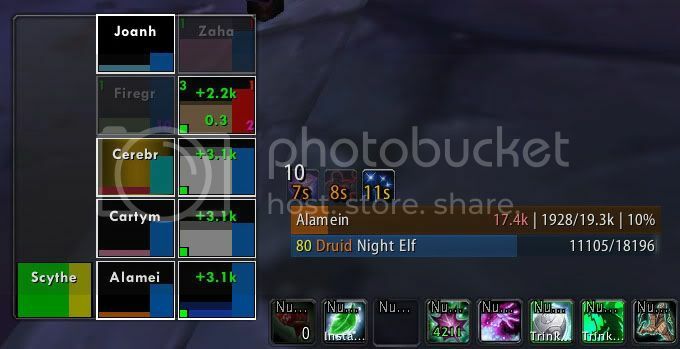 The default UI fails at Observe, because it's difficult to arrange and isn't good at showing you heals, buffs, and debuffs. It also fails at Act, because you have to click on a toon and then either click or keypress to cast a spell. These two actions have to happen sequentially; it doesn't seem like a long time. But you can easily cast 200 spells in a 5 minute boss fight; those fractions of a second can really add up. Your UI will have to show you all this information, in a way that's clear to understand but also not too complicated. Remember those 1.5 second loops? You don't have time to read hover-text on debuff icons, or to click on a bunch of toons to see who's cursed. Oh, and you'll need to watch the fight, too; you need to know if a Flame Wall is coming or if you're standing in a void zone. I've moved all my raid frames to the center-bottom of the screen. I could never keep track of my health when it was in the upper-left; this way it's very visible. The down side is that it obscures some parts of the screen. The goal here is first to get a quick look at the raid: who's hurt? (After Gluth does a Decimate, the answer is: everyone!) You can also see here that Firegrin and Zaha are out of range; that tells me instantly if I need to move to heal them. One thing you don't see here is my aggro indicator; anyone who draws aggro will have a red border around their unit. That way I know who's getting beat on, for instance if the tanks need to trade off each other. Similarly, I'll see an icon and a colored border around any toon that's either poisoned or cursed. It's very dense, but it gives me a lot of information in a compact package. I track most HOTs in the corners. The top left shows me the total HOT count, including everyone's HOTs; this way I can see if another healer has left something behind. The other corners count down the time on Wild Growth, Rejuv, and Regrowth (bottom left). Lifebloom, meanwhile, is in the middle; that way I have a clear indicator of when to refresh the stack. (I'm just going to wait and see whether I want to keep this setup after 3.1 lands. Sigh.) 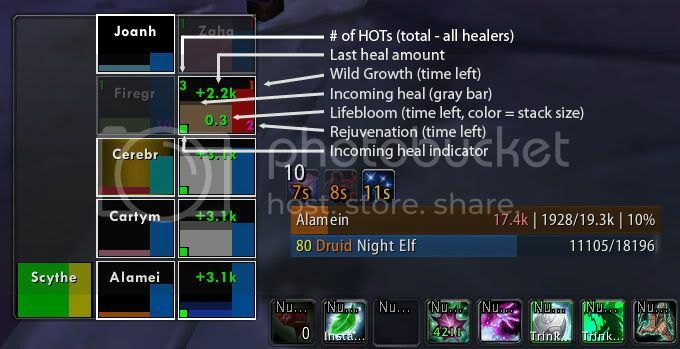 I've also able to see incoming heals, so I know whether someone else is healing up a toon. It's a lot of information in a small space, but it's less confusing than you'd expect. It's very easy, with three corner indicators, to see where your HOTs are. That's especially useful for Wild Growth. Lifebloom is front and center, for now, because I will usually maintain 2 or 3 LB stacks for my tanks. (Soon to end, alas, alas.) And it's all close to the center of my view area; that means my eyes don't have to move much to see the larger environment. Those are all goals to strive for, no matter what addons you use. So what about casting spells? There's two pieces to this: who are you casting on, and what are you casting? (If you want to slice it fine, you could split that into Decide and Act.) In the default UI, you select a toon by either clicking on it or on its unit frame. You can use the F1-F5 keys for your party, but that doesn't extend to the whole raid. You then cast spells either by clicking buttons on your action bar, or by mapping those buttons to keys. There's a lot of ridicule for "clickers", which has some basis behind it; it take a good bit of time to pull your cursor across the screen and get it targeted to a fairly small button. Still, there's a reason that so many players do it; it's simple and direct. With keys, you always have to remember which key maps to which ability. Also, you usually don't have time to look at what key you're pressing, so you have to go by touch. These are skills that you should work to build, because you'll probably find them faster in the long run. Don't be afraid to accept a short-term setback, if it will make things better in the long run. So what comes after select-and-cast? There are two main styles that you can use: click-cast and mouseover-cast. These are both ways to reduce two separate actions into one smooth motion. They'll both be quicker than select-and-cast. How do they work? Mouseover-cast removes the click action from the process. Basically, you set up macros for your spells so that they will be cast on whatever target is underneath your cursor. So you just point at what you want to heal and then press the key with the right macro on it. Click-cast removes the separate key press from the process. It's almost like select-and-cast, but not quite. It uses a combination of mouse clicks and modifier keys to cast spells, choosing the spell based on the modifier key and casting the spell when you click on a toon. So that works well for me. I know however that many healers prefer using the mouseover-cast technique; it wouldn't surprise me if it's more popular than click-cast. The biggest advantage is in setup; you can do it all through macros on the standard UI. I suggest you try whichever option sounds more natural to you; try it for a couple weeks, and see how it's working. If it feels awkward, try the other approach. This has been a long debate in the community. What are the best healing tools? I honestly don't think there's a clear winner; the short answer is, the tool that you like is best. I'm not going to spend much time on the analysis, because there's a lot of good stuff already written about it. But here's the short(er) version. If you want to try mouseover-cast healing, you can do that without addons. You'll start by creating mouseover macros for your healing and cleansing spells. Sydera at World of Matticus has written a great mouseover macro guide that can help you out. You can start out doing that with the vanilla raid frames (or whatever you're currently using) and see how you like it. I think probably the most common solution is to use Healbot. It provides unit frames, along with a click-cast interface. You could of course turn off the click-cast and use mouseover macros if you prefer. Keeva at Tree Bark Jacket has an excellent review of Healbot that you should check out. I'm not a Healbot user, so I can't make its case well. I know that a lot of people use it, and the common wisdom seems to be that it's the easiest addon to set up. Personally I didn't find it that simple when I tried it, but your mileage may vary. The other major raid frame competitor is Grid. It gives you the unit frames, but doesn't have the casting options that Healbot has. (Here's another great Keeva review.) Grid also allows/requires additional addons for specific tasks, such as GridStatusHots, GridStatusLifebloom, and GridIndicatorCornerText. That's even more stuff to set up, but provides for some powerful capabilities. You can of course use Grid with mouseover macros, but if you prefer click-casting, I recommend Clique as the addon to use. It adds a tab to your spellbook that enables the setup of click-cast mappings. The most common knock against Grid+Clique is that there are two addons you have to manage instead of one. I see that as a strength; each addon is focused on a specific task. 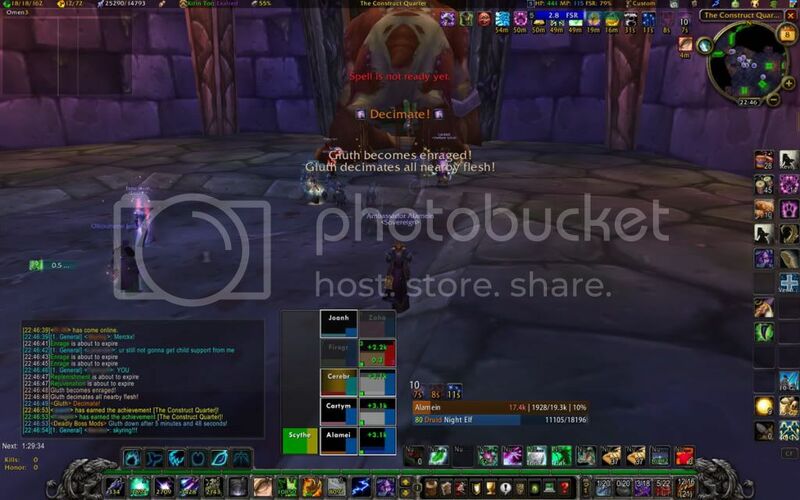 You can read a long and very informed debate about the two approaches on Elitist Jerks in the Resto UI Discussion. My best advice is to try something, see if you're happy, and if not, switch. At some point I should write up the details of how I configured my UI. In short however I used the techniques described in this EJ post from the Resto UI thread. You should see most of the elements described there in my screencaps above. I also have separate Grid setups for 5/10 man, 25 man, and 40 man setups; you can swap between setups with macros. Let me know if you want to hear more about my setup, and I can write up an article about that. So, there you have it. I feel a bit disappointed that I can't provide the One True UI Answer, but the reality is that there's a lot of good approaches you can use. My best advice is to try something, decide what works and what doesn't, and change based on it. Your UI can be your best ally or worst enemy for healing. Spend some time on it, and it will reward you. Great post! I've been doing some work on my own UI lately and posted about the changes I've been working on in my own blog over the past couple of weeks if you want to take a look. My main priority was to have all of the information that I need, while using as little screen real estate as possible so that I could have a nice, full, uncluttered frame to see the action. This has helped my performance tremendously in terms of reacting to my own physical space and changing raid conditions (i.e. don't stand in fire). because I have so little visual noise on my actual raid window, I can catch changes easily out of the corner of my eye, even when I am focusing primarily on grid and casting heals. Thanks for a very well thought out and enjoyable article! I am a healbot user and I find that when I look at other tools (grid, vuhdo) I compare them with healbot, but that's only natural. I would like to hear more about your UI setup. I looked at resto4life and keeva's setup for grid and never got grid working in a way I liked. In fact, I disliked the display so much, in comparison with healbot, that I didn't even set up clique. I do still feel compelled to fully understand grid though as it is very popular and if it would help me be a more effective healer, that is good for everyone. I agree with Syll about the cleaner UI allowing one to not stand in the void circles much faster. My reaction time got much better when I set things up to only have to look at healbot for raid information. Healbot shows me who is has the main threat, who is peaking in threat and will take aggro soon, who is poisoned or cursed and, of course, who needs heals and what HoTs they have on them already. I also have mana bars showing so I can watch the other healers to know when I have to step in before they say so on vent. What I find hard about grid's display is that it isn't as much the 'at a glance' situational awareness interface that healbot is for me. That it does work that way for so many keeps me from dismissing it entirely and wanting to learn more. So please do write more about your setup. I'd like to try it again with some guidance. We druids do have to stick together.